Mayor Sam Liccarado plans to get the city’s logo tattooed on his body, so long as he gets one million retweets on Twitter. One million retweets is all it’s going to take. 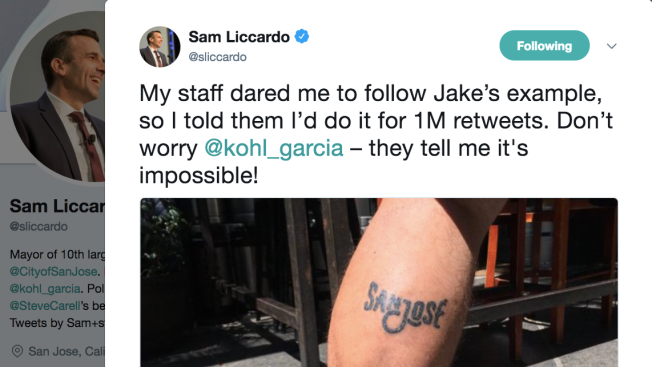 “My staff dared me to follow Jake’s example, so I told them I’d do it for 1M retweets,” Liccardo said in a tweet Tuesday morning. The challenge comes weeks after San Jose local, Jake McCluskey, tattooed the city’s newest logo on the back of his leg. McCluskey used the tattoo to commemorate the completion of his most recent quest – to run every street within San Jose city limits. So far, Liccardo has received over 800 retweets.